A former spokesman for United States Ambassadors to the United Nations, Richard Grenell, has warned against the election of General Muhammadu Buhari, as Nigeria’s president. According to him, any attempt to enthrone the ex soldier will bring disaster to the entire African continent. Grenell handed this strong warning in a piece entitled: Nigeria on the brink, and was published in the Washington Times, a US based publication, of Thursday, March 19, 2015. The former envoy claimed that Buhari was working tirelessly to enforce Sharia law across the country. 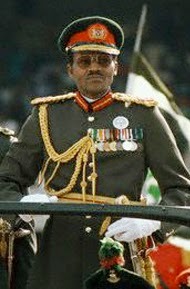 This, he said would further pose a major challenge to the fight against terrorism in Nigeria and the continent at large. He said, “Western foreign policy observers pre-occupied with the rise of ISIS in the Middle East should wake up to the reality unfolding in Nigeria. Opposition candidate General Buhari wants Sharia law throughout Nigeria. In fact, he wants it everywhere. “Is this an indication that Buhari supports violence because the end goal of the terrorist attacks throughout Nigeria and Africa is an Islamic state? It is a legitimate question that should be asked by leaders of the Obama administration. “Boko Haram has pledged its allegiance and support to ISIS. The Northern Nigerian based Islamic terrorist group wants Sharia law throughout the country and beyond. They are also actively terrorising Chad, Niger and Cameroon with their goal of an Islamic state. “Buhari has also spoken sympathetically about members of the terrorist group Boko Haram, has cautioned against a rush to judgement on its members and has personally been selected by the terrorist group to lead its negotiations with the Government of Nigeria. According to Grenell, Goodluck Jonathan should be commended for his fight against the Boko Haram sect. He said the incumbent deserved the support of the Barack Obama led United States administration and the rest of the world. “The Nigerian economy has been growing faster than South Africa’s. Imagine what Nigeria could do for Africa if it was also free of Boko Haram’s violence. The Obama Administration should be doing more to ensure Africa’s most populous country doesn’t slip away,” he said. “Islamic radicals have Africa on their target list and young Nigerians are reported to be interested in ISIS’ messages. Nigeria is at a tipping point. The West, and specifically the Obama Administration, needs to wake up to the growing problem,” he said.